November 1 is the day on the Christian calendar for remembering saints – those luminous people in whom the light of Christ seemed to shine in a particularly engaging way. It is immediately followed, of course, by November 2, All Souls Day, when we are invited to remember those other saints – those beloved people whose light shined in our own lives, but who escaped the notice of the larger church. In today’s Episcopal Church, all of this usually gets celebrated together on the first Sunday after November 1. All Saints/All Souls gets a lot of us thinking about endings, I think. It gets us thinking about our beloved dead, whose presence in our lives is missed. And, perhaps, it gets us thinking about our own eventual demise, when our time in this world will come to an end and our loved ones will be thinking about us at this time of year. Certainly, the Christian tradition intends that we should also think about beginnings at this time of year: for we hold the conviction that (as the Book of Common Prayer puts it) “life is changed, not ended” when we die, and that somehow our life continues in God’s eternal embrace. 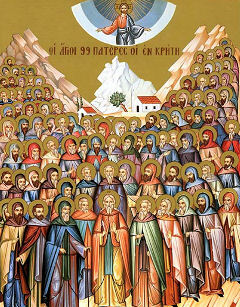 Indeed, All Saints is a celebration of the communion of saints, the great fellowship of the living and the dead who somehow remain in relationship. But, let’s face it. For most people, this business of life beyond the grave is a kind of blurry hope that, in our heart of hearts, we are a bit uncertain about. We are more often a people living not in hope of everlasting life, but in fear of the inevitability of death. We are preoccupied with endings, and with the fear of endings. One of the ways this shows up in religion and culture is in our love affair with apocalypse. Think about the wildly successful Left Behind series of books, essentially a novelized version of the Book of Revelation. So many people insist on reading Revelation as a story (or, worse, a blueprint) about the end of the world. They focus on the way in which God will destroy sinners and basically implement a scorched earth policy with respect to the greater part of humanity. Setting aside whether or not one can legitimately draw this out of Revelation, the fact that this New Testament book gets cast as being a book about a great ending rather misses an important point: that Revelation is not so much about this world ending, but a new world beginning. Revelation, amidst all its rich and intense imagery, seeks to present a vision of our world transformed into a global community that values justice, compassion, and harmony. But our preoccupation with and fear of death leads us to miss the hope that Revelation seeks to invite us into. Another example is found in the pop cultural treatment of the end date of the known Mayan calendar, which falls in our calendar on December 21, 2012. A strangely large number of people have rallied around this Mayan doomsday scenario, believing that the Mayan’s somehow had an insight into the date of the world’s ending. Some people, it has been reported, are spending thousands of dollars on Mayan doomsday tours that land them somewhere in Guatemala on the supposed date of the earth’s demise. Recently, descendants of the Maya have been voicing their objection to this interpretation of their tradition. One Mayan elder said recently, “the Dec. 21 ‘doomsday’ is actually the beginning of a new time cycle on the Mayan calendar and ‘means there will be big changes on the personal, family and community level, so that there is harmony and balance between mankind and nature…. '” (reported in The Huffington Post). Just as the Book of Revelation can be read not as a book about destruction but as a book about a dream for harmony and peace, so the Mayans of today suggest that their calendar tradition is about pointing humanity toward harmony and balance – about hope and life, not destruction and death. I wonder what it would be like if the human community could stop living out of a fear of death and instead begin living out of a hope for life. I wonder what it would be like if we let go of our preoccupation with endings and “the end” and, instead, pursued a love of new beginnings. As the Christian community celebrates All Saints today and this coming Sunday, perhaps we can remind ourselves that one of the gifts of Christ to us is supposed to be overcoming our fear of death. In Christ, we see that for God, death is a non-thing. It has no reality. Instead, it is a passage that leads to a new beginning, a luminous chapter of our lives that we can only barely imagine. Our tradition does not proclaim that God is out to get us. Rather, it proclaims God’s undying love for us, a love overflowing with hope and life. It is precisely this love that the saints understood and experienced, and in which the lesser known departed saints of our own lives now rejoice.